Sometimes I miss the snow. I miss the excuse of not leaving the house because you can’t get out the door. I miss the calming effect snow has as it falls. Most of all, I miss the cozy feeling of curling up on the couch with a hearty bowl of stew, watching the snow fall. This chickpea stew is the hearty type of meal best served when the temperatures are low and you have a crusty loaf of bread on hand. 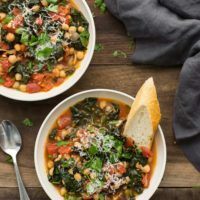 Best of all, this chickpea stew is the type of meal where I always have everything on hand so it comes together quickly and easily! Perfect for a cold winter night, this chickpea stew is simple to make with a few key pantry ingredients. Make it vegan by leaving out the parmesan! In a large pot or dutch oven, heat olive oil over medium heat. Add shallots and let cook until tender and fragrant. Add garlic, thyme, and salt and pepper to taste. Next, pour in chick peas and let cook one to two minutes.Then add diced tomatoes, vegetable broth, and parmesan. Bring to a boil then add in chopped kale. Stir, reduce heat, and let cook until the kale is wilted, about 5 minutes. Serve with a sprinkle of parsley and parmesan. Tips & Tricks: You can easily use dried herbs instead of fresh. Reduce the amount to 1 teaspoon of dried thyme. Use a microplane zester to shred the parmesan so it melts and incorporates into the broth. Stews are great for playing in the kitchen as the vegetable broth/tomato base is a solid starting point. While I used diced tomatoes in the above instructions, crushed tomatoes are also a nice option. Try my suggestions below and pair this chickpea stew with crusty bread and a light salad. Greens: Switch up your greens! 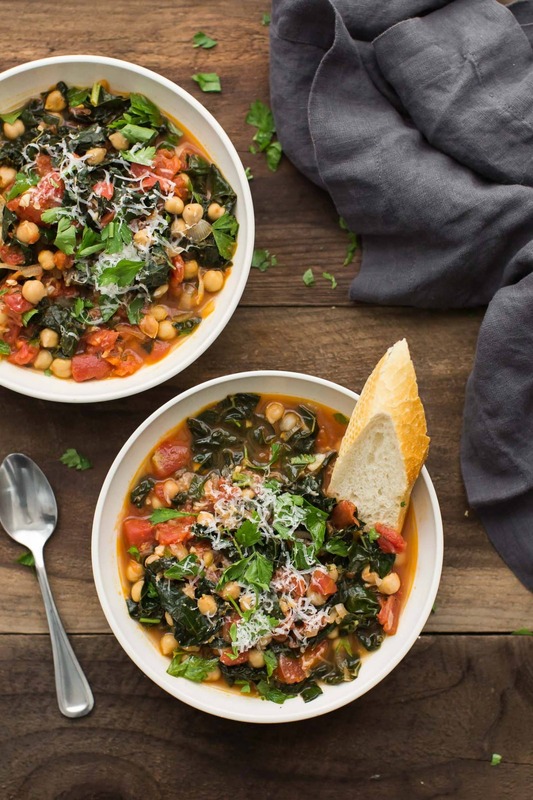 Use collards, swiss chard or spinach instead of kale for this stew. Legumes: This recipe would also be excellent with kidney beans or white beans instead of chickpeas. You could also leave out the legumes all together if desired. 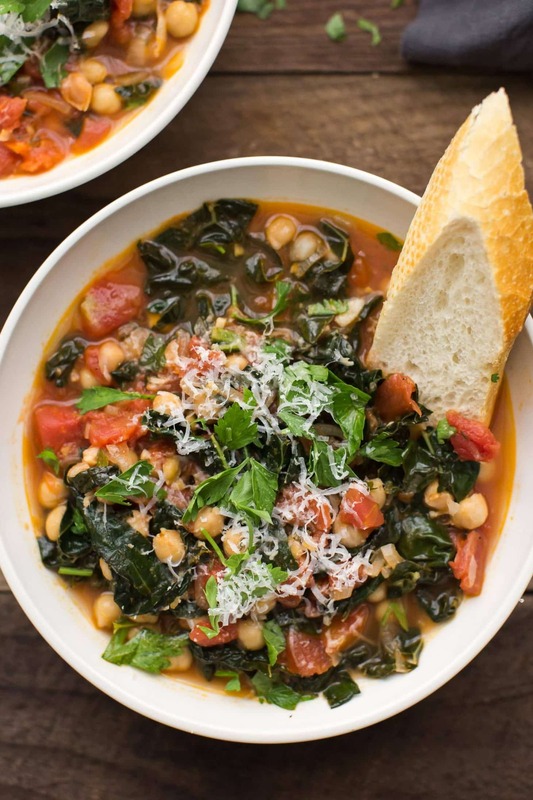 Vegan: Omit the parmesan cheese for a vegan friendly version of this stew. If you’re going with this option, I recommend switching to crushed tomatoes to add a hint of creaminess to the broth. I always keep a few cans of tomatoes on hand for sauces, soups, stews, and even paella. It’s a pantry must-have! Stewed tomatoes are a favorite because the sauce is just the right thickness and the flavor is always spot-on but I also keep diced, crushed, and whole tomatoes on hand. 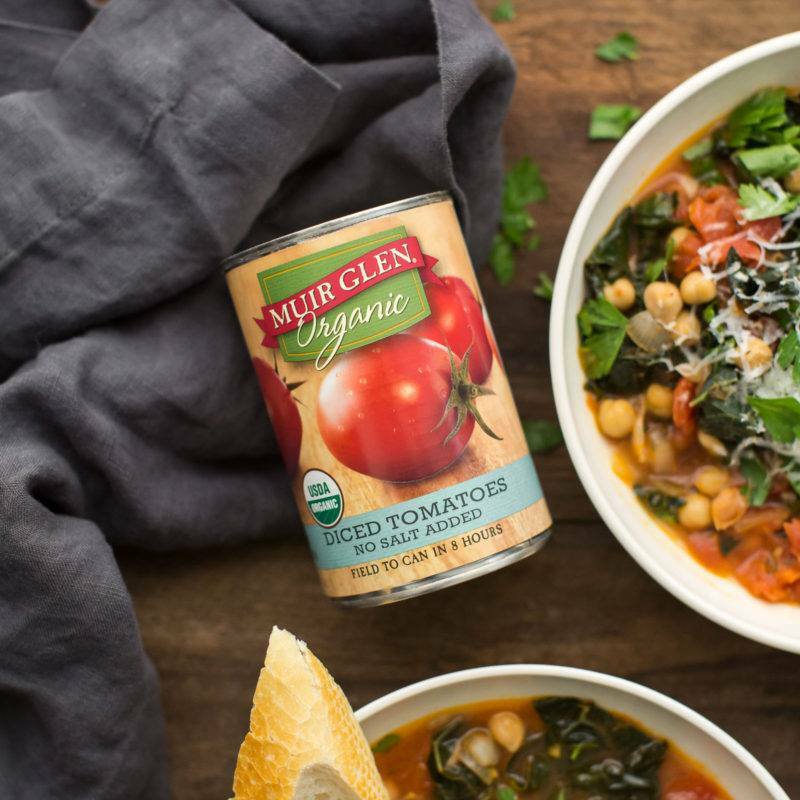 So many of my hearty fall meals start with a tomato base! I made this for lunch today, it was so quick to come together and delicious! I put a parmesan rind in the with the soup while it simmered instead of grating the cheese. 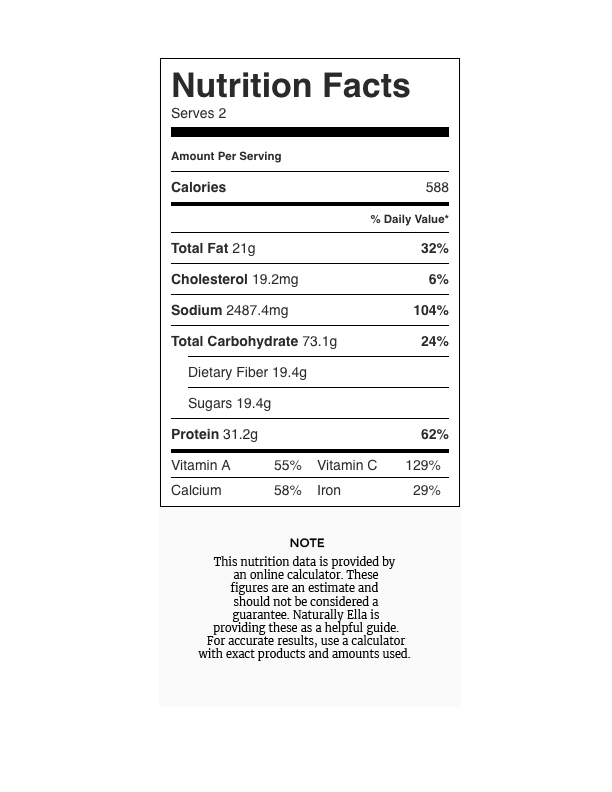 Great flavor with one less step. Thanks for a great recipe. Just made this; I’m eating it right now, and wow! So simple, comforting, and delicious! Definitely will make again.. and again! I just made this tonight, it was really good and perfect after a cold day. My man is not really into kale but asked for a second bowl! That’s a good sign! so delicious! cooked the chickpeas about 3-5mins instead of 1-2min. huge thumbs up, we loved it!! I made this today. It was delicious!! We loved it. I did add 2 cans of beans and diced tomatoes. Awesome as is!! I added a bag of left over frozen mixed veggies the third time I made it. Great!